Note that the affinity laws for pumps are not identical with fans. - if the volume flow capacity of an existing system is increased with 10% - the power supply increases with 33% and the electrical motor and the power supply may need an upgrade. Replace the default values with the actual values. The calculator is generic and can be used with all common units as long as the units use is consistent. Replace the default values with the actual values. The calculator is generic and can be used with all common units as long as the use is consistent. Use of the fan laws can sometimes be simplified by using Equivalent Static Pressure - ESP - defined as the pressure that would be developed by a fan operating at standard air density instead of the actual air density. ESP can be useful when selecting fans from published data based on standard conditions. Engineering ToolBox, (2003). 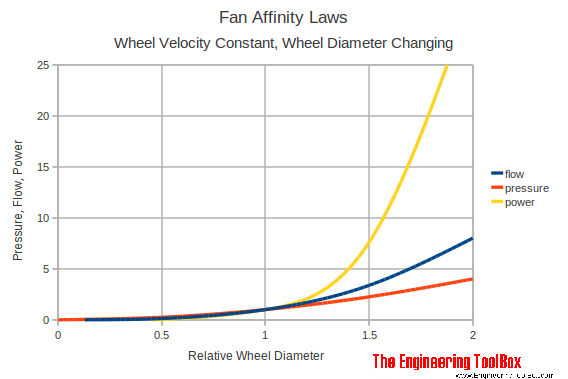 Fan Affinity Laws. 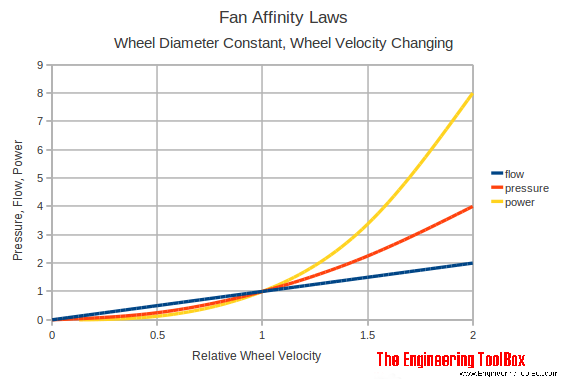 [online] Available at: https://www.engineeringtoolbox.com/fan-affinity-laws-d_196.html [Accessed Day Mo. Year].